WW1 Reenactments Equipment : Great War Tommy WW1 Food Rations Labels : Campaign Marching Chocolate wrapper. 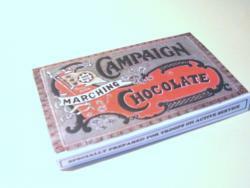 WW1 Reproductions and WW1 Reenactors Equipment / Kit - Campaign Marching Chocolate wrapper. A bit conjectural, but colourful. Worked up from a relic 'White Standard' brand part-label. The style and design seems to predate WW1 so possibly from the Boer War period?